As two of Marvel’s premiere superhero teams, the Avengers and the X-Men have a long and tangled history of being both adversarial and distrusting of each other. The latest chapter in this 50-plus year Cold War, Avengers & X-Men: Axis, published its final chapter this week. So with Marvel’s most recent event now in the books, we thought we’d take a look at the 10 best Avengers/X-Men storylines/crossovers from the past half century. 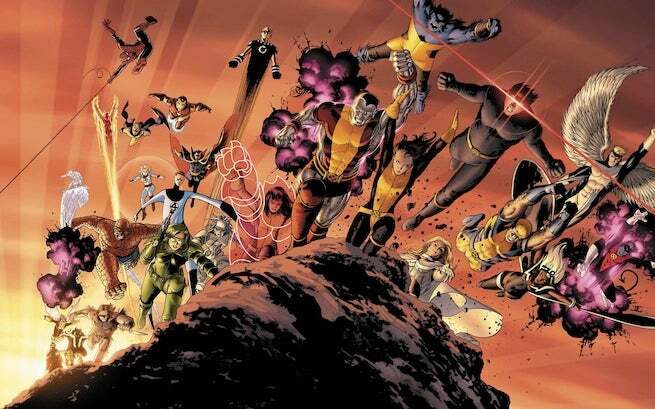 So, this story is really less of a team-up or a crossover as it is a depiction of pretty much all of Marvel’s heroes (including the X-Men and Avengers) standing around dumbfounded as Kitty Pryde manages to sacrifice herself and save the world. Still, it warrants special mention on this list for being the coda of Joss Wheedon’s phenomenal run on Astonishing X-Men, and for capturing one of the most courageous and selfless acts (not to mention heartbreaking) in X-Men or Avengers history. 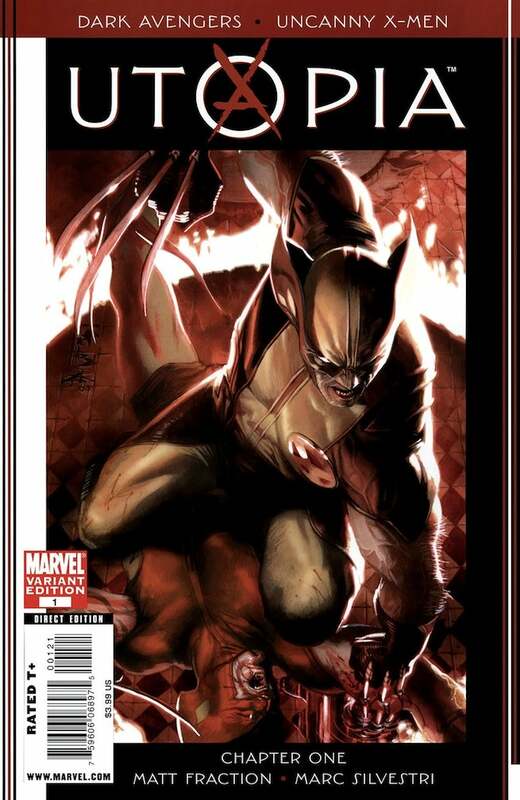 In the wake of Secret Invasion/"Dark Reign," "Utopia," which was primarily penned by Matt Fraction, focuses on how Cyclops and the X-Men combat a Marvel Universe that is being controlled by Norman Osborn and his Dark Avengers. 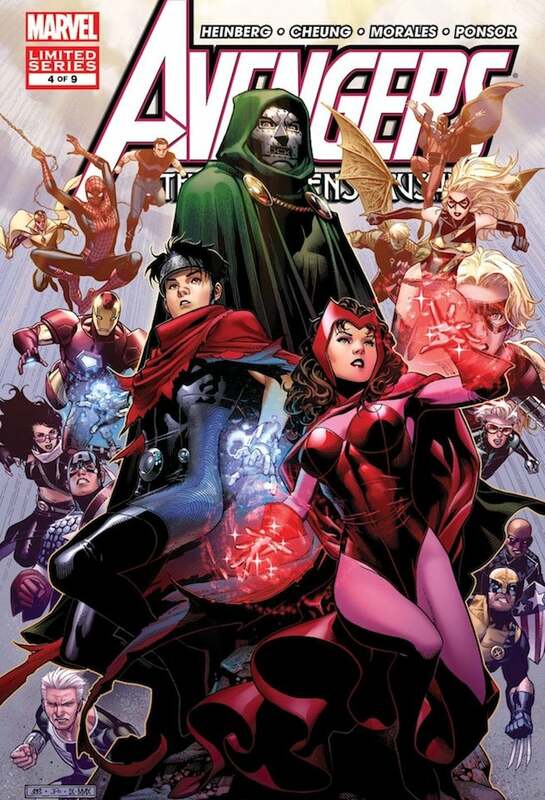 The event that shaped the summer of 2012 and set up the Marvel Now initiative and its flagship book, Uncanny Avengers (which then begat Avengers & X-Men: Axis). This 12-part miniseries features the Avengers and X-Men doing what they do best: FIGHTING. This time around, the crisis revolves around the young Hope Summers, who is believed to be the conduit for the returning Phoenix Force. Since everybody involved in this miniseries has read the suitably epic "Dark Phoenix Saga" (as featured in the pages of Uncanny X-men), they understand that the Phoenix Force in the wrong hands would be a catastrophe. So the Avengers want to take custody of Hope until this whole thing blows over while Cyclops decides to dig in his heels for mutant-kind – leading to issue after issue of fisticuffs. The whole event garnered mixed reviews from most critics, but was a wildly popular seller. Plus, it dramatically altered Marvel’s status quo, especially with Charles Xavier’s death (who is murdered by an enraged Cyclops). This three-parter from Steven Englehart and Don Heck is a fairly famous story for those who closely follow the lives of the Maxmioff twins, aka, Scarlet Witch and Quicksilver. Avengers #110 kicks off innocently enough with the Avengers getting word from Quicksilver, who was last seen facing heavy attack from the Sentinels, that he was safe and in the care of the Inhuman Crystal. When Quicksilver announces his love for Crystal, Scarlet Witch figures it's a good news sharing kind of a day and lets her brother know that she is in love with the android Vision. Quicksilver doesn’t receive the news all that happily and tells his twin to never speak to him again. But there’s also an X-Men/Avengers story in the middle of all this (not to mention Daredevil and Black Widow get involved too). 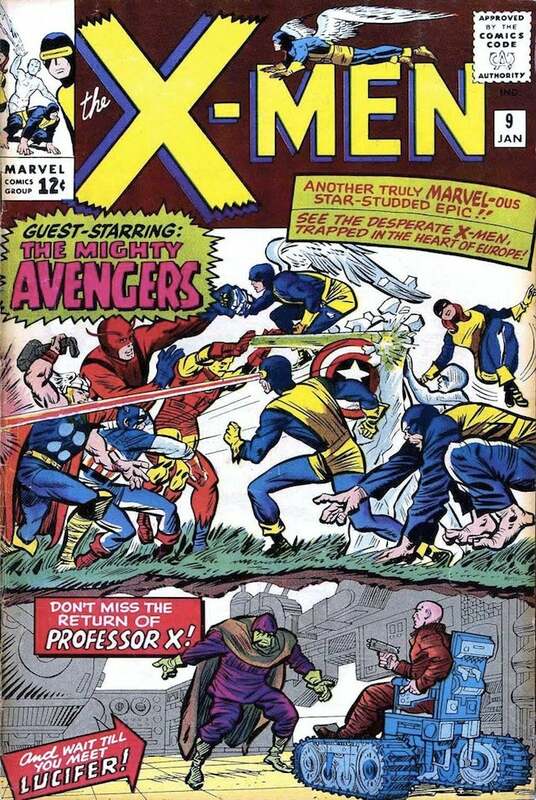 Magneto concocts another scheme to take out all of his enemies by getting the Avengers to respond to what appears to be a melee at the X-Mansion. In Avengers #111, Magneto reveals that he has a new power – the ability to control people by manipulating the iron in their blood (this power would go on to be a pretty big deal in the years that followed). By manipulating the X-Men and Avengers, Magneto plans to raise a new army of mutants to destroy mankind. Fortunately, Vision is able to rise above it all and defeat Magneto. Another crisis averted. 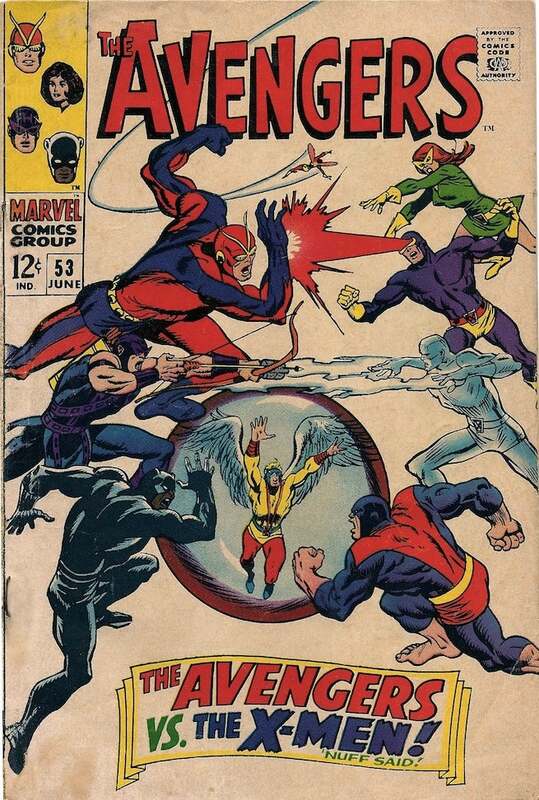 Before the days of constant crossovers that saw heroes and villains from different comic book series frequently interacting/fighting with each other, Avengers #53 was quite historic in that it was among the very first times Earth’s Mightiest Heroes went toe-to-toe with Magneto. In this story, Magneto, ever the evil-genius, convinces Scarlet Witch and Quicksilver to rejoin his Brotherhood of Evil Mutants. 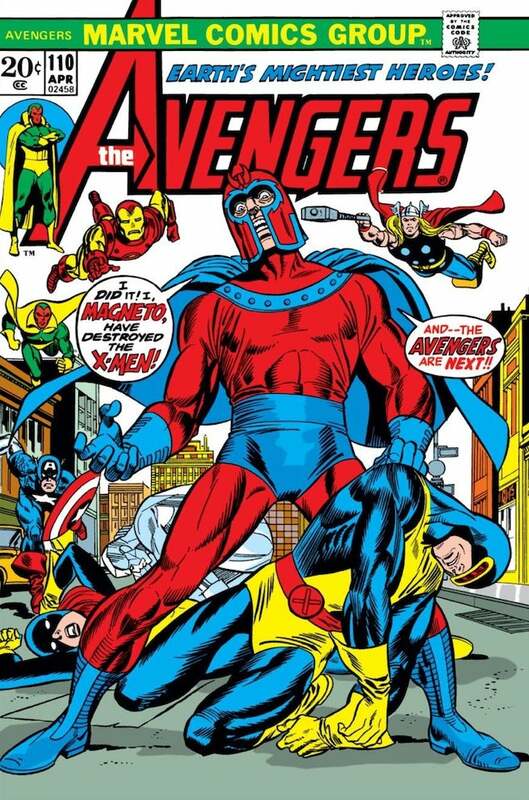 This causes quite the kerfuffle when Black Panther, Goliath, Hawkeye and Wasp come across Cyclops fighting Quicksilver – unaware that their Avengers teammate has realigned himself with Magneto. 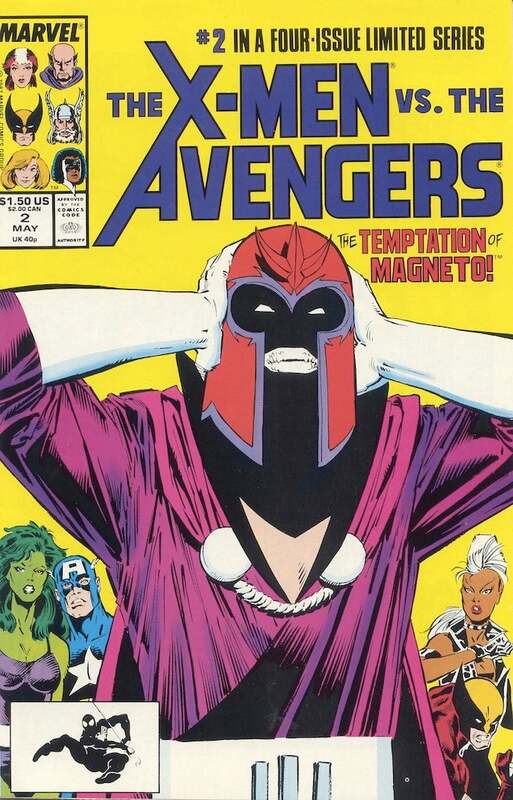 Magneto continues to play the two teams against each other throughout the story. Fortunately, the X-Men and Avengers are wise to Magneto’s chicanery, and play-up their mutual animosity in order to get the jump on the villain. The storyline ends with Magneto’s apparent death – his status would be upgraded to “living” some time later (see No. 8). While technically a Young Avengers story proper, The Avengers: The Children’s Crusade miniseries also marks another fantastic showdown between the (grown-up) Avengers and the X-Men. This time around, the two groups clash over the fate of one-time Avenger (and a mutant by blood – unless you count the most recent retcon), Scarlet Witch. Fresh off of Wanda crippling mutant-kind in House of M, the Young Avengers, led by Magneto, set out to find her to see if she would be able to restore the powers she took away in the preceding event/miniseries. Wanda’s presumed children, Wiccan and Speed (who bear a striking resemblance to her and her brother Quicksilver), head to Wundagore Mountain and discover that Wanda is actually a Doombot, which then prompts them to head to Latveria for a showdown with Doctor Doom. When they arrive, Doom and Wanda (who has amnesia) are engaged to be married. We later learn that Doom manipulated Scarlet Witch into committing a number of crimes against the Marvel Universe (as we originally saw in "Avengers Disassembled" and House of M). Still, even with this new information, the Avengers (most notably Wolverine) are ready to kill Wanda on site while the Cyclops-led X-Men are also looking for some justice for the events of M-Day. And since we can never have two rival superhero teams chasing after the same prize without a fight, you can guess how the Avengers and X-Men respond to each other when they both stumble upon Wanda. This 1965 comic, from the masters, Stan Lee and Jack Kirby, marks the very first X-Men/Avengers team-up/battle, setting the standard for superhero misunderstandings for years to follow. In this story, the X-Men are investigating the villain Lucifer, who has attached a thermal detonator to his heartbeat, thereby making it next to impossible to physically attack him. The X-Men learn of this valuable information first, and are weighing their options, when the Avengers storm in, guns a-blazing, ready to take down Lucifer. The X-Men try to stop the Avengers from making a bigger mess out of the situation (like blowing up an entire city), but the Avengers disregard the mutants and a fight breaks out between the two teams. Charles Xavier is able to telepathically talk some sense into Thor, which leads to the two teams uniting to defeat Lucifer. The story is a great example of how even in the early years of the Silver Age, there was something about these two teams that would prevent them from ever getting along. A somewhat controversial comic that is also notable for marking the first appearance of the wildly popular mutant Rogue, and for being one of earliest appearances of the villain Mystique, Chris Claremont reportedly wrote "By Friends Betrayed" as a way to rectify the Avengers’ past actions as it related to Ms. Marvel, aka, Carol Danvers. The annual issue kicks off with Spider-Woman rescuing Carol, who has lost her memories while battling Mystique and Rogue. Carol is taken to the X-Mansion where the mutants work with her to help her regain her memories. 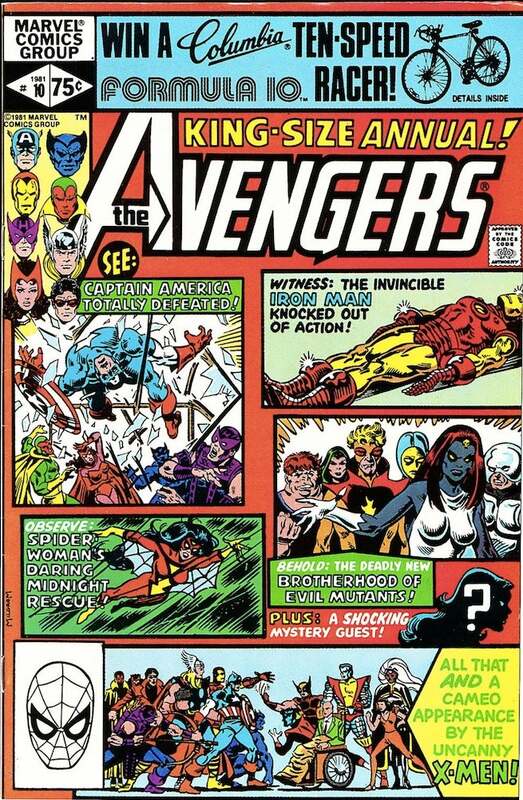 While she’s recuperating, the Avengers pay Carol a visit, who they have not seen since they had battled the time-controlling villain, Immortus. When the Avengers seemingly trivialized how Carol was forced to have a physical relationship with the Immortus’s son Marcus, Ms. Marvel tells Earth Mightiest Heroes to go away so she could continue to stay with her new friends, the X-Men. In later X-Men stories, Claremont would lean heavily on how Rogue handled the new powers she stole from Carol, while Danvers would continue to appear in Uncanny X-Men and some of the other X-books after she is transformed into the super-powered Binary. Marvel’s original event comic, this historic 1984 miniseries (which is getting a proper renewal from Jonathan Hickman next year) is notable for how it shines a very interesting light on mutant/non-mutant relations. 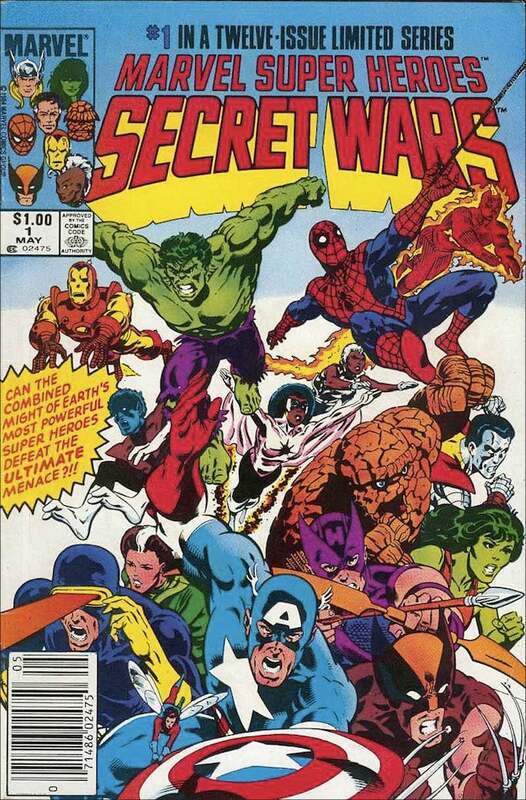 Secret Wars starts with all of Marvel’s notable heroes and villains getting magically transported by the cosmic force known as the Beyonder to the planet Battleworld. There, they are ordered to (appropriately enough) engage in a war with each other for the Beyonder’s amusement. However, the X-Men (and Magneto), who are both initially placed with Marvel’s heroes, separate themselves from the pack and become a third faction. While the X-Men had always been portrayed as outcasts in the Marvel Universe (see every other entry on this list), the fact that they couldn't even be grouped with Marvel's non-mutant heroes as part of an otherwise fluffy, action figure-driven event like Secret Wars is quite eye-opening. Of course, when Doctor Doom goes ahead and gains the power of the Beyonder, the X-Men and the rest of the heroes do forge an uneasy alliance, but writer Jim Shooter does cast that otherwise predictable collaboration in doubt in how he paces his story. Not be confused with the aforementioned AvX, this 1987 miniseries from Roger Stern and Marc Silvestri (who collaborated on the first three issues before being replaced by Tom DeFalco, Jim Shooter and Keith Pollard for issue No. 4) marks the very first time the Avengers and the X-Men co-headlined a book together. This series came at a very interesting time in X-Men history as the team’s long-time adversary, Magneto, had officially joined the side of good and was trying to atone for his past sins. Regardless, both the Avengers, who want Magneto to stand trial for his crimes, and a Soviet group of super soldiers, are vying for the Master of Magnetism, while the rest of the X-Men team vehemently defends the former villain. 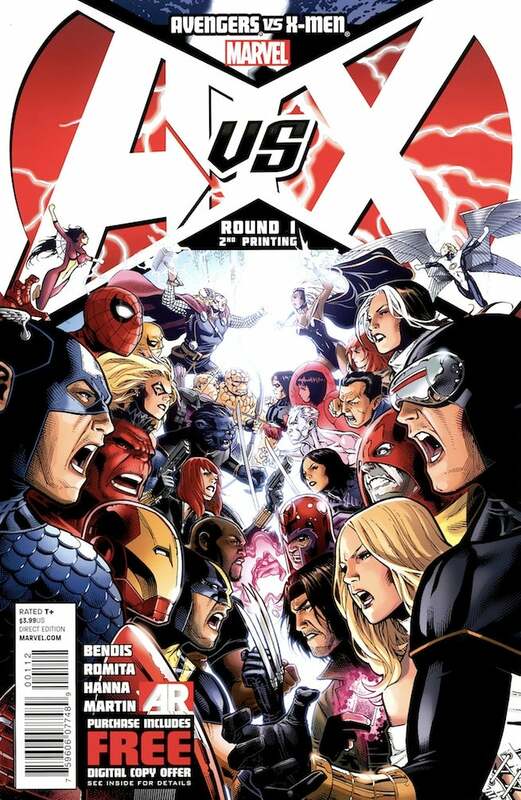 While some editorial interference clearly changed the direction of this series (hence the fill-in creative team for the last chapter – Stern reportedly wanted Mangeto to revert to his villainous ways and was vetoed) it still reads as one of the better Avengers/X-Men storylines. The somewhat reluctant/uneasy alliance between Magneto and the X-Men is filled with natural tension and yet the way Magneto is characterized still demands sympathy from the reader, especially when the Avengers demand he be brought into custody no questions asked. The storyline/event that has truly driven relations between the Avengers and the mutant population for the better part of a decade, 2005’s House of M ends very famously with Scarlet Witch uttering the words, “no more mutants,” subsequently depowering millions of mutants across the globe. But leading up to Wanda’s industry-changing statement, House of M (by Brian Michael Bendis with art from Olivier Coipiel) is one of the all-around great Marvel miniseries since the event comic first became a thing. For the uninitiated, Wanda, who has been driven mad from the realization that she lost her children (as depicted in the "Avengers Disassembled" arc), creates an alternative reality where her kids are alive again and she, her brother Quicksilver/Pietro and her (at the time) biological father, Magneto, reign supreme. Meanwhile, the rest of Marvel’s superhero population wake up in a world where their wishes have all been granted – Spider-Man is a celebrity married to Gwen Stacy, Cyclops and Emma Frost are married, etc. But one they all discovered that this world is just a creation of Wanda’s immense power, the you know what hits the fan pretty quickly (which brings us back to “no more mutants”).